Karen Hand is a Board Certified Hypnotist and National Guild of Hypnotists Certified Instructor, NLP Master Practitioner, and EFT Facilitator. She is an active member of NGH, NFNLP, and IACT. Karen has studied with leading hypnotists and NLP trainers from around the world and is certified to perform and teach various techniques including regression and forgiveness of self and others and parts work. Karen has helped clients make amazing changes in their lives--changes that include greater self esteem and self acceptance, a lasting positive attitude, release of limiting beliefs or paralyzing fears. Karen specializes in pain management, 5-PATH® Hypnotherapy and protocols in the management of migraines, Fibromyalgia, IBS, smoking cessation, weight control and habit change. She also teaches the art of hypnosis in classes scheduled throughout the year and conducts ongoing workshops for conferences and small groups. 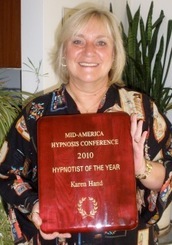 Karen received the Hypnotist of the Year Award at the 2010 Mid-America Hypnosis Conference. The conference board recognized Karen for her outstanding work with clients, her continuous learning, and her contribution to the professional development of other hypnotists. In 2013, Karen was appointed a member of the Board of Directors of the Mid-America Hypnosis Conference. Inn 2014, Karen received the Leadership Award from Banyan Hypnosis, California. You might remember Karen from her long career in Chicago radio. She was News Director, on-air personality and talk show host at WLS, B96 and WCKG. She headlined the top-rated program "Private Lives" with Dr. Kelly Johnson for more than a decade, helping Chicagoans with self improvement and relationship issues. Karen transitioned into hypnosis in 2005 as owner of the Chicago franchise Positive Changes and then Chicago Hypnosis Center. She is now in private practice on the north side of Chicago. Karen is also a member of the International Association of Counselors and Therapists (IACT) as well as the Skokie Chamber of Commerce.